He was the perfect cross with Poco Bueno and out of a daughter of Son O Sugar. Son O Sugar bloodlines are very popular in the more modern cowhorse world right now because of thier trainablility and dispositions. 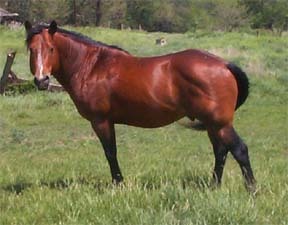 We rode Trouble as a young horse and he was very athletic, quick, smart, and has loads of personality. However, after a tornado swept through our place Trouble was no longer sound to ride or show. Trouble"s colts are now starting to make an impact in the show pen and he has produced his first NCHA money earner! See him on our performers page!